How Do Sliding Glass Doors for Pets Work? Pet-friendly patio doors will save you time and hassle while retaining the functionality and attraction of your sliding glass doors. Advanced Window Products can easily install replacement glass into your existing door in minutes! It will work exactly like your existing door, but contains a solid, secure, panel insert that is designed with the size of your pet in mind. The days of planning your schedule around potty breaks and cleaning up after accidents are over. Don’t worry about hurrying home from work, getting out of bed at night, or stopping everything to let your best friend outside. Your pet can let himself out of the sliding glass door anytime, without waiting for help to go out or come back in. This door gives both of you comfort in knowing he will not have to “hold it” and can enjoy the outdoors anytime! Finally, if your doors are all scratched up or your dog howls to get your attention, this door is the solution! Imagine eliminating noisy barking, destructive scratching, or whining at the door. Your dog can enjoy the view and stroll outside without having to get your attention first, allowing you to keep a scratch-free door and some peace and quiet for you and your neighbors! Watch your pet enjoy the outdoors at his leisure from the attractive windows without having to open or close the door. These doors provide peace of mind and save effort! Don’t interrupt what you are doing to open the door or worry about asking a neighbor or paying a pet sitter to come by when you are out. 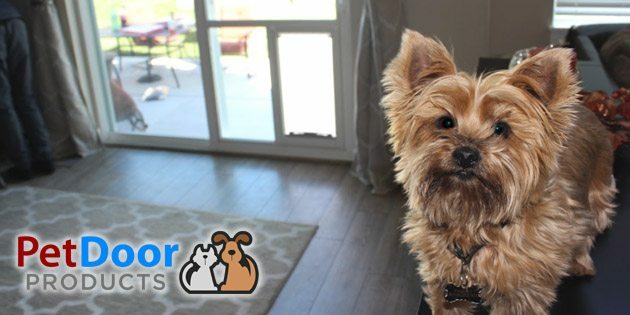 If you are ready to save time and eliminate the hassle of constantly letting your pet in and outside, contact Pet Door Products at (801) 973-8000 or complete the form on this page for a free sliding glass pet door estimate!